Download BlueStacks and Play World Cup Now! To share our excitement about the upcoming FIFA World Cup 2018, BlueStacks has decided to have a World Cup of our own for our users. There is some serious fun to be had and incredible prizes to be won! We all know that World Cups are always filled with unbridled excitement, countless adrenaline rushes while watching your team make that one critical goal, and a whirlwind of a whole lot of other emotions. So what does one do when they’re not watching matches? One needs to engage themselves somehow! 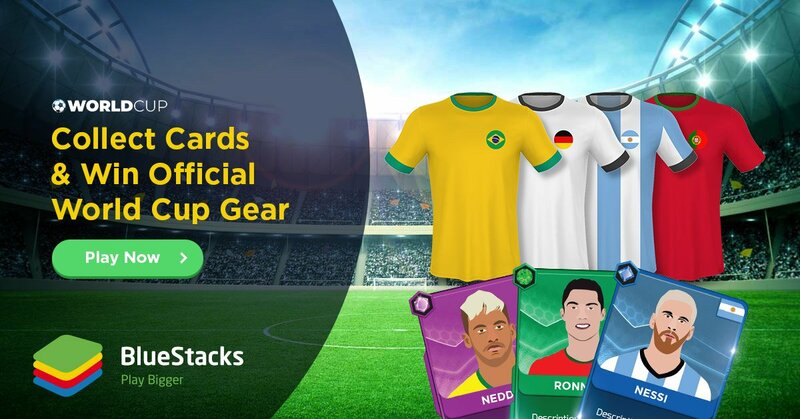 We have the answer, you can now play in your very own World cup with BlueStacks and win Official World Cup 2018 Gear while you do so! What is the BlueStacks World Cup ? Each player representing each of the 32 National Teams part of the FIFA World Cup 2018 has a card of their own. Think 23 times 32 cards to be won in all! Each player card has a rarity (Common, Rare, Epic) and a token value attached to it depending on the popularity and skill level of the respective player. The token value of your collection increases as you collect more cards. If you complete a full team roster, you receive a bonus valued at 10% of the team’s combined token value. You can choose your favorite team from the 32 teams participating. If you completing your chosen favorite team’s roster, you receive a 15% bonus of the team’s combined token value. The event is divided into 3 stages; The Group Stage, The Elimination Round (Round of 16 and Quarter Finals), and The Final 4 (Semi Finals and Finals). Each stage has been designed to follow the real schedule of the FIFA World Cup as closely as possible with a few days before and after it. There are rewards to be won at each Stage mentioned above with a limited number of GUARANTEED winners everytime. Of course, as we move closer to the Grand Prize, the prizes incrementally get bigger while the number of guaranteed winner gets smaller. Each stage will have a token requirement that the users must race towards. The first ‘X’ number of people to cross the minimum token value, will be eligible for the rewards of that stage. Users, after crossing the required token value, must maintain it till the stage ends for it to be valid. Failure to maintain the value will move the reward to the next one in queue. So be careful, and don’t trade away or sell cards after making it to the reward value. How to get Player Cards? Users can collect cards in 3 ways: Play, Trade, Buy. By playing games on BlueStacks, cards will be dropped randomly and added to their collection. The longer the user plays games, the greater are the chances of card drops. Participating in BlueStacks Quests (Quests change weekly) gives you a chance of getting better cards and sometimes even card packs. If you get duplicate cards and want to trade them out to complete your team, you can do that in the “Trading Square” in Pika World inside BlueStacks. There are no rules to Trading, and you are allowed to be as greedy or charitable as you want. Have the skills to trade 3 commons for an Epic? Go for it. You can buy a variety of BlueStacks World Cup card packs from the Store. Each pack has its own specialty. Some might give you a large number of cards, but not enough highly rated cards, while some may give you fewer cards, but with guaranteed Rares or even Epics. The Marketplace is a nifty place if you have duplicates or are looking for specific players that you just cannot seem to find. It is a community driven market where users can buy and sell individual cards. You can buy card packs and cards with PikaPoints, and you earn PikaPoints by completing actions on BlueStacks. Please note that cards collected can be viewed in “Home” in Pika World, under the World Cup tab. You can change your chosen Favorite team after each round, keeping it competitive to the very end. Enough about rules, let’s talk prizes! What all can be won? PS: All prizes come from the Official FIFA store. We know you’ve had your eye on those cleats for long, they can be yours now, for real! You must have been waiting for the World Cup with bated breath, and we just gave you 711 more reasons! Let’s make this World Cup the best one so far! Let’s play bigger and better with BlueStacks!